At a recent gathering I was asked, “What do you do?” My answer surprised even me. I said, “Nothing.” What I meant, really, was that I don’t do anything in the ordinary sense of what the world means by that question. What I do do is somewhat difficult to express in a sentence or two. beginning and the end” (2) in the New. Thirteen hundred years earlier, the Celtic bard had perfected the response to “Who are you?” into a series of poetic clues by stating who he had been, where he had been, and what he had accomplished, the cumulative effect of which revealed the essence of his being. Additionally, the answer cryptically incorporated the marking of the passing seasons of the sacred “year and a day,” and the realization of the unending circularity of time. We are meant to understand in the recitation of the sacred Druidic incantation, that the combined attributes of valour, sacred knowledge, clarity, and inspiration are what is needed to resolve the questions of the universe. I am a seeker, a thinker, and a mystic exploring the wonder, the mystery, and the meaning of the universe. My journey has been interrupted often by circumstances that demanded my attention elsewhere, but this is the place to which I always return. This is what nourishes me. I have spent the better part of my life searching, and researching, whether in the more mundane world of such practical pursuits as law and real estate, or in the sacred realm of the spirit. My interdisciplinary research, which formed the basis for my many years of teaching, has incorporated studies in the fields of comparative ancient religions, archetypal literature, and ancient art. This pleasurable work has yielded more than several lifetimes of compelling material from which to draw. I have written thousands upon thousands of pages detailing my findings, and yet, there are always more questions. One path inevitably leads to another; each road taken unearthing an infinity of connection and discovery. So the windings and unwindings of the journey meander, with purpose, and yet, are purposeless. This, they say, is the secret to finding the “wondrous isles,” (7) the place where your heart resides. I have experienced the ecstatic euphoria of near-death, not once, but twice. Floating in that liminal place that is neither here nor there, I have seen that immeasurably bright idyllic paradise whose bliss is irresistible. Whether in deep meditation or in death, hearing is the last sense to go out into the universe. (8) And it was the faintest sound of loving voices circling around and around, calling my name, that brought me back to earth. The second time, it was the Bodhisattva, herself, who must have heard the stilled voice that couldn’t call her name. For days, as I wove in and out of consciousness, I was periodically awakened by a gleaming golden aura of light emanating from a sunlit bronze statue of Kuan Yin, ‘She Who Hears the Cries of the World’. It is said of the Buddhist Goddess of Compassion, whose presence graced an altar directly across from my bed, that the mere calling of her name in times of distress is sufficient for her to intercede to save your life. I couldn’t even do that, and yet, I was bathed in the bliss of her light, under her protection. It was she who brought me back again, and again. And I have no doubt that it was Kuan Yin who placed me in the very capable life-giving hands of a hospital nurse who was a secret practitioner of the Eastern healing art of the laying on of hands. They had written me off for dead when she stepped in to watch over me. And then, one day, as though a bolt of lightening-like energy had struck me, I was suddenly alive. I have always been susceptible to states of reverie induced by things of beauty, found refuge where harmony and order reign. Music has often been the door to these states of ecstasy – that unbearable perfection of a beautiful voice or a sonorous passage, which makes the soul swoon almost to fainting. (10) Perhaps, too, it is the transcendent circularity of music, the perfect resolution of the eternal return that carries the soul into that state of bliss. Or maybe it is the effect of the rhythms on the heart. And to poetry I return, again and again, to the euphoric waves “At the still point of the turning world” (11) where “the dance is”; (12) to the elegiac angels, “unable to tell whether they move among living or dead”; (13) to the unbearable despair of a king who rages at the storm of his making; to the tribulations of Odysseus, and the mindful unravelings of Penelope. I stand, at the urging of the King, to pay my respects at the singing of the Hallelujah. (14) I stand, too, shoulder to shoulder with Sir Bedivere, King Arthur’s sole surviving knight, transfixed, as the mournful barge dissolves into “one black dot against the verge of dawn.” (15) And on that shore, I, too, watch and wait to witness the return, to hear the timbre of a long-missed voice. I have walked the hallowed grounds, danced with the fairies under the hill, and in the mountaintops have I danced with the dancing bears of Artemis. I have entered the forbidden sacred grove, met the Erinyes face to face, and propitiated their rage. I have trod the smoothed marble floors, weaving my way through Ariadne’s labyrinth, and have traced the tangled silken skeins of Maeve’s indecipherable web of sleep. I have been touched by Hermes’s magic wand, enchanted by the Druid’s spell, have watched the wise Teiresias as he gathered wisdom from the whirling of his birds, and pondered the messages of the murmuring doves in the whispering leaves of Diana’s wind-blown oak. I have heard the mysterious music rising over Gaia’s oracular peaks, and have soared through that rarified air on the wings of hawks who traced the sounds like so many ribbons in the sky. At the rising of the dog-star I have followed the path of he who leads the way through an endless confusion of spiraling whiteness to a stardust realm beyond seeing, beyond hearing, beyond imagination. And I have dreamed dreams. I have known “the silence that is incomprehensible and the idea whose remembrance is frequent”; (16) have heard, in the silence, the sound of the breath moving upon the face of the waters, seen the silent waters moved out of their absolute stillness by the infinite reverberation of rushing wings. And I have lain in the arms of Aphrodite, and looked into her eyes, and asked her with my eyes to ask again yes and then I asked her would she yes to say yes . . . and first she put her arms around me yes and drew me down to her so I could feel her breasts all perfume yes and my heart was going like mad and yes she said yes I will Yes. (17) And this is as it was in the beginning, is now, and ever shall be, world without end. Amen. (18) All the more, have I felt the bitter sting of the inextricable arrow and the pain of its irretrievable extraction; all the more wept, as I watched the swan maiden find her feathered cloak to dance the sky with the sun. The mudra of the Buddha’s hands composes itself into contemplacency. My eye is distracted from its re-weaving of the meandering pattern of a tribal rug as the thunderous call of the wave is echoed in the voices of a radiant orange crescendo. There is the faintest smell of the sea in the lingering after-notes, and then there is silence. From a distant mind arises the far-off tinkling of bells, then thunder – deepest droning of deepest sound, unheard, reverberating in the hollow passages – deeper now, deeper yet, deeper yet again. Deep in meditation, layer upon layer of harmonic wave rises toward audible infinitude. As if suspended in more tranquil air, the notes cease their outpouring to await the arrival of the moment. And then, with one unhesitating sweep of the arm, a Messiah, disguised as a “simple monk,” (19) disperses an incalculable number of grains of sand to the mandala’s edge for their return to the sea. Breathless, I bear witness to a lesson in the impermanence of all life. The solemn chanting begins again. AUM MANE PADME HUM. Through each successive transformation I mark the passage of time on the palm of my hand in the ancient Ogham alphabet of the trees, noting the comfort of being so grounded in nature. I muse that the riddle of the bard reveals the total essence of his being, not just within that world, which is the only world, but as that world. Surely, this is the quintessential resolution of the mystery and the meaning of the universe enshrined in the passage of the year. And in this one turning is contained the totality of all that exists from every turning of every year from the beginning of time until the end. And in the turning, do I now know that the awareness of time shuts out eternity, that the eternal is beyond time, that the experience of the eternal is here now. Oh, hear the sacred vowels, unspoken, reverberating in space, encapsulating the infinite, sounding the silent movement of time. Amen. Allelujah. AUM. Hymn the gods. Enchant the stars. Sound the seasons. Howl the moon. Sing the stones. Hear the harmony of the spheres. 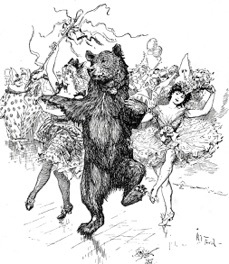 FRONTISPIECE: Illustration by H. J. Ford, ‘The Minuet Was Tom’s Greatest Triumph’ from the Alexandre Dumas Story Tom: An Adventure in the Life of a Bear in Paris in The Animal Story Book. Andrew Lang, Editor. (New York, London and Bombay: Longmans, Green, and Co., 1899). The quotation is from T. S. Eliot, Four Quartets, “East Coker” 3.28. ENDPIECE: William Shakespeare, The Winter’s Tale, IV. iii. 140-42. 1. Exodus 3:14. King James Version. 2. Revelation 22:13. King James Version. 3. William Shakespeare, King Lear, I.iv.85. 7. Alwyn Rees and Brinley Rees, Celtic Heritage: Ancient Tradition in Ireland and Wales. (London: Thames and Hudson, 1961), p. 346. 8. See: Sleeping, Dreaming, and Dying: An Exploration of Consciousness with The Dalai Lama. Francisco J. Varela, Editor. (Boston: Wisdom Publications, 1997), pp. 191-92. 9. T. S. Eliot, “The Love Song of J. Alfred Prufrock”, 1917. 10. There is a famous photograph of Leonard Bernstein in exactly this attitude of delirious ecstasy that visually describes what I mean. It is etched on the CD: Bernstein, Reaching for the Note: His Life in Music. Deutsche Grammophon 289 459 553-2. 11. T. S. Eliot, Four Quartets, “Burnt Norton” II. 62. 13. Rainer Maria Rilke, Duino Elegies, “The First Elegy”, 1912. Lines 81-82. 14. Of Georg Friedrich Handel’s Messiah. 15. Alfred, Lord Tennyson, Morte D’Arthur, 1842. 16. “The Thunder: Perfect Mind” VI.2. in The Nag Hammadi Library: in English. George W. MacRae, Introduction and Translation. Douglas M. Parrott, Editor. James M. Robinson, General Editor. (San Francisco: Harper & Row, Publishers, 1977), p. 298. 17. A re-arrangement of the last lines of James Joyce’s, Ulysses, 1934. 18.Found throughout the old version of The Book of Common Prayer of the Protestant Episcopal Church. 19.This is who H. H. The Dalai Lama says he is, and it is he who performs this Kalachakra Mandala rite. 20.The Song of Amergin, 1268 B.C.E., in Robert Graves, The White Goddess: A Historical Grammar of Poetic Myth. (New York: Farrar, Straus and Giroux, 1974; 7th printing of Amended and Enlarged Edition of 1966), pp. 207-08. 21.You will find these stories told, here and there, in these pages.